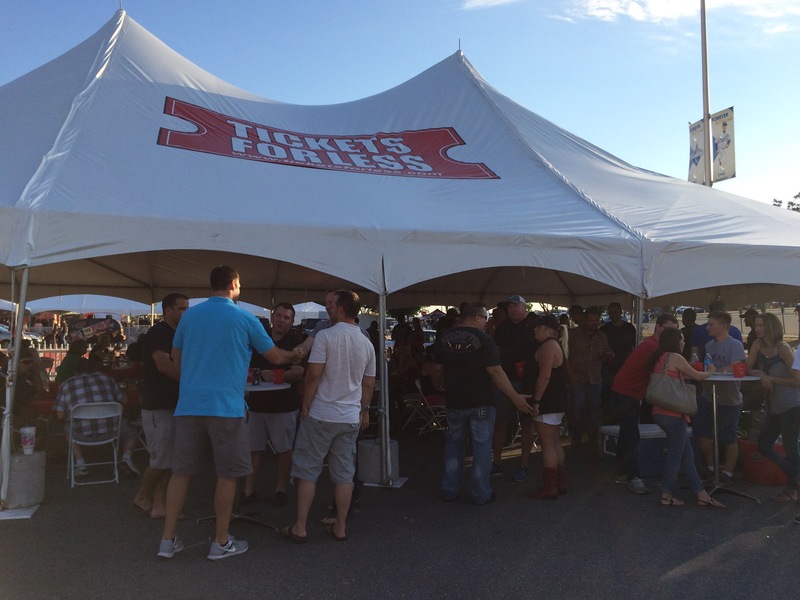 The Tickets For Less VIP tailgate tent opened Wednesday evening for the very first time, ahead of the Guns N’ Roses concert at Arrowhead Stadium. About 130 Tickets For Less customers enjoyed delicious catered barbeque, with beverages provided as well. The stadium was just a short walk from the tent, which was in Lot M of the Arrowhead parking lot, between the two stadiums. The tent is shown in the photo gallery below. There are photos of the tent as well as a look at the concert. Click on the pictures to see them up close. The VIP tent from Tickets For Less began with Arrowhead Events adding Tickets For Less as an official sponsor on June 6. The VIP tent will now be available at all ticketed events at Arrowhead Stadium, which includes Kansas City Chiefs games and concerts. Guns N’ Roses live was a once-in-a-lifetime experience. The original lineup of the band from its “Appetite For Destruction” days, the debut album which launched Guns N’ Roses into stardom, hadn’t been together for 20 years. Guns N’ Roses hadn’t played in Kansas City for 24 years. The next concert to hit Arrowhead will be Kenny Chesney’s “Spread the Love” tour on July 16. Get tickets to that show and many more at ticketsforless.com. To order a VIP tailgate tent pass, select TAILGATE PASS when purchasing your ticket.